What is Cross-Origin Resource Sharing (CORS)? 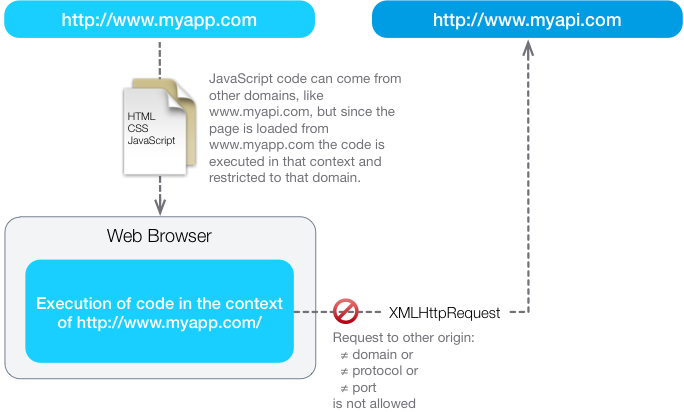 Why we need to know about (CORS) in the context of HTTPS? Here is in details discussion. You can read which SSL certificate you need if you yet not have installed SSL certificate. It is quite common with SSL to get errors for this Cross-Origin Resource Sharing (CORS) part. Minimum should be known. Cross-origin resource sharing (CORS) is a specification of a technology browsers that defines means for server to allow its resources to be accessed by a web page from a different domain. This type of access would otherwise be denied the same origin policy. CORS defines a means by which a web browser and web server may interact to determine whether or not the cross-origin requests will be allowed. It is an agreement that allows great flexibility, but it is safer to allow all requests of this type. Support for Cross-orign was originally proposed by Matt Oshry, Brad Porter and Michael Bodell from Tellme Networks in March 2004 for inclusion in the VoiceXML 2.1 to allow requests for cross-orign data securely VoiceXML browsers. The mechanism was considered to be general in nature and not specific to VoiceXML and was later implemented via a separate Implementation Note. The WebApps Working Group of the W3C with participation of the major browser vendors have begun to formalize Note on a W3C Working Draft in the way of a formal status of a W3C Recommendation. The CORS is supported by all browsers based on the engines – Gecko 1.9.1 (Firefox 3.5, SeaMonkey 2.0) and above, WebKit (Unsure about the initial version, Safari 4 and higher, Google Chrome 3 and higher, possibly earlier), MSHTML / Trident 4.0 (Internet Explorer 8) provides partial support via XDomainRequest object. CORS can be used with a modern alternative to standard JSONP. While JSONP requests only supports using the GET method, CORS also supports other types of HTTP requests. With CORS it is possible to use common XMLHttpRequest. On the other hand, JSONP works with legacy browsers without CORS support. CORS is supported by most modern browsers. This Article Has Been Shared 7862 Times! DNS Prefetch and Link prefetching in HTML5 is a method to resolve the fully qualified domain names before an user tries to get the linked static files. Cite this article as: Abhishek Ghosh, "Cross-Origin Resource Sharing (CORS)," in The Customize Windows, September 8, 2014, April 21, 2019, https://thecustomizewindows.com/2014/09/cross-origin-resource-sharing-cors/.